For today's post, I've done a 3-D item. 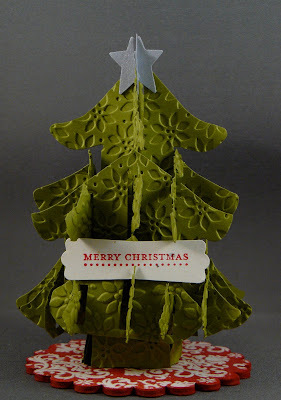 The Christmas tree is made using the O Christmas Tree Pop-Up Bigz die from the Holiday Mini Catalog. After cutting out all the pieces out of Old Olive card stock, I textured it using the Petals-A-Plenty Textured Impressions folder. Once assembled, I attached it to a scallop circle (using Sticky Strip) cut from the Scallop Circle #2 die from chipboard. The Christmas Cocoa Specialty designer series paper was cut from the same die and glued to the chipboard. 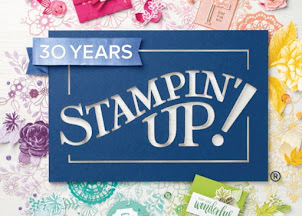 The star is from the tree decorations Sizzlit die out of Brushed Silver card stock. Finally, the "Merry Christmas" from Teeny Tiny Wishes stamp set, was stamped using Real Red Classic ink and punched out with the Modern Label punch.